Another coalition would start almost immediately after the end of the 3rd Coalition due to worries about allowing the French to become too powerful. France had promised the small country of Hanover to both Britain and Prussia, but wasn’t giving it to either, which would upset many. When Napoleon killed the German nationalist Johann Philipp Palm for a pamphlet that attacked him this would cause the official decisions by the majority of the the Coalition. It was decided that Napoleon had too much power over European affairs at that point, especially in what he had called the Confederation of the Rhine. The Prussians started the war before any of the other allies were ready and while this surprised Napoleon, he did have troops close to them and could mobilize them quickly too. He would tell his troops that they would have been able to go home if it wasn’t for the Prussian army, which caused his troops to be highly motivated to punish the Prussians for this. Napoleon also noticed that the Prussians had a large number of officers and correctly assumed this would slow their decision making in battle. For this reason, Napoleon would rely on speed and attack his enemies as fast as possible. Jena and Auerstedt (1806). French Marshal Michel Ney attacked even before getting his orders at the Battle of Jena, hoping to overwhelm them before they could react. The Prussians would counterattack during this because Ney overextended his army in the attack and would nearly lose the battle because of it. Napoleon’s troops showed up just before it was too late and forced the Prussians to retreat when he attacked them from all directions. After their near win at Jena the Prussians tried an attack on a single French unit that was alone and outnumbered. Despite the large numbers of Prussians they would lose at every point of the attack because of the better tactics and training of the French. The Prussian army would finally collapse after their commander died. With no one to direct their attack, no one was willing to risk things against the strong French army. Napoleon, like usual, would take all the credit for the victories even though his army had performed spectacularly without him. In the end 160,000 French soldiers would defeat the 250,000 Prussian soldiers and would end up controlling the Kingdom of Prussia for the next 6 years. 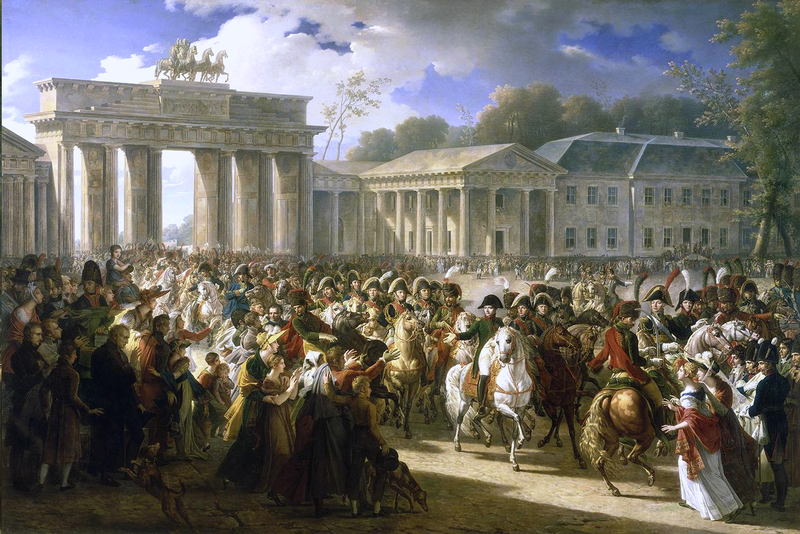 It took the French a total of 19 days to beat the Prussians and capture their capital of Berlin. He did, however, show a little bit of modesty when he visited the tomb of Frederick the Great in Berlin, telling his men that they would have lost this battle if Frederick the Great were still alive.